After Dysport treatment to the forehead and frown lines. Individual Results May Vary. At Imagen, we use Dysport to relax wrinkles caused by the frequent movement of the muscles of facial expression. This results in a more relaxed, stress-free and youthful look. Dysport has been used in millions of patients worldwide to treat undesirable frown lines between your brows, forehead wrinkles and to soften crow’s feet around the eyes. But that’s not all it can do! Dysport can also be used to soften the jawline, improve a gummy smile or lift the tip of your nose! Click here to read a blog on other uses for Dysport. The treatment helps to minimize lines of expression and therefore can help you to look younger and more refreshed *. If you have lines or wrinkles on your face from the movement of your facial muscles, then you may be a good candidate for Dysport. If your lines are deep, you may need several treatments before you see significant improvement. There are very few people whose facial wrinkles will not be improved with Dysport treatment. What should I expect when receiving Dysport at Imagen? Our experienced physicians perform all of our facial rejuvenation treatments. Dysport is a minimally invasive treatment that does not require anesthesia (although as a courtesy we can numb the area before hand if you would like, just let us know!) Dysport is an office-based treatment that only takes a few minutes to perform. You can expect to see the results in as little as 3 days*. How long your Dysport results last depends on many factors. For most patients, the results will last between 3 to 5 months. If you are looking to prevent wrinkles from forming (like many of our 20 to 30 year old patients), you may only need treatment every 6 months. If you already have deep lines, you may desire treatment as frequently as every 3 months. It all depends on how your muscles respond to the treatment. What are the risks of Dysport? Is Dysport safe? Dysport is a very safe treatment. It has been used in millions of patients world wide and has been FDA approved for treatment of wrinkles in the US since 2009. The most common risk of Dysport injection is bruising. This is most common when treating the crow’s feet. To reduce the risk of bruising, you may wish to ice the treatment area before and/or after the injection. Oral or topical Arnica can also help to prevent or treat bruising. Droopiness in the brow or eyelid can also occur. This is typically related to placement of the Dysport and can often be improved with another injection. Our physicians have years of experience with Dysport. None of the effects of Dysport are permanent. Many patients are surprised at how affordable Dysport treatment can be. All of our Dysport treatments are based on the number of units used. If your muscles are very strong, you may need more units initially. For many patients, as the muscles weaken with repeated treatments, they may need fewer units to achieve the same effect. 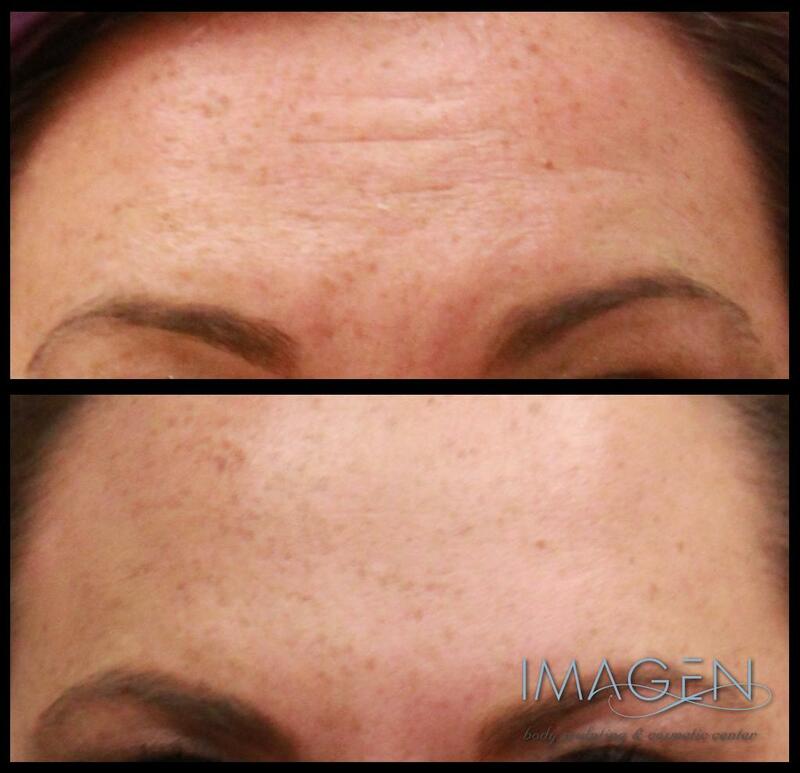 At Imagen, our Dysport is only injected by our experienced physicians, we don’t use any nurse injectors. Our Dysport is $4 per unit. A typical treatment for the frown lines or crow’s feet will usually start at $144. We do participate in Galderma’s Aspire, a loyalty program for Dysport users. Every time you get a Dysport treatment you earn points. These points can then be redeemed for coupons to use toward your next treatment. You can sign up for the program here. If you think that you may be ready to move forward with a Dysport treatment, or even if you just want more information, we would recommend that you come in for a free consultation with one of our doctors in Omaha, Nebraska. We would be happy to do your injection that same day if you would like. If you live outside of Omaha (we have patients from South Dakota, Des Moines and other cities in Iowa, Grand Island, Kearney and even Western Nebraska) we would be happy to review your photos in a virtual consultation. To schedule your appointment, please call/text our office at 402-509-8473. We look forward to meeting you!